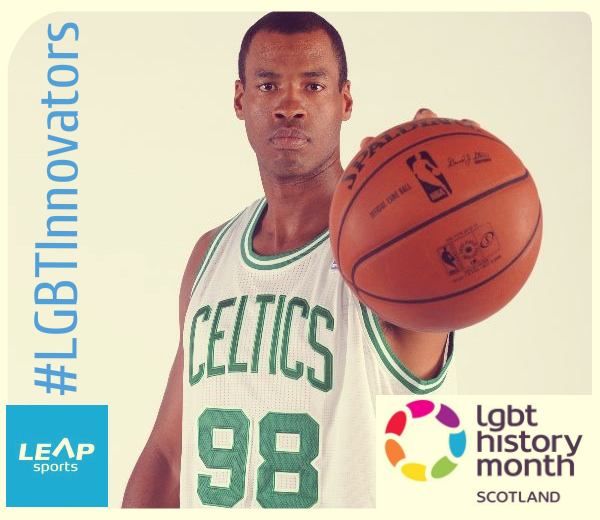 #LGBTInnovators - American Former Basketball Player Jason Collins | LEAP Sports Scotland NBA). He played college basketball for Stanford University where he was an All-American in 2000–01, before being drafted 18th overall pick in the 2001 NBA draft by the Houston Rockets. He went on to play for the New Jersey Nets, Memphis Grizzlies, Minnesota Timberwolves, Atlanta Hawks, Boston Celtics, Washington Wizards and Brooklyn Nets. After the 2012–13 NBA season concluded, Collins publicly came out as gay – he was the NBAs first player to come out and continue playing. He became a free agent and did not play again until February 2014, when he signed with the Nets and became the second publicly gay athlete to play in any of four major North American pro sports leagues. In April 2014, Collins featured on the cover of Time Magazine’s“100 Most Influential People in the World”. Collins has played for six teams over 12 seasons. He said his final motivation for coming out was being unable to participate in a gay pride parade in Boston in 2012. Written on 16th February 2016.